Advanced Pain Relief and Healing for Your Dog or Cat! Gettysburg Animal Hospital is pleased to offer the latest treatment in healing and pain relief—laser therapy. Laser therapy incorporates a beam of laser light which treats tissue injury without damaging it, inducing a biological response in the cells which leads to reduced pain, inflammation, increased joint mobility, and increased speed of healing. Most treatments only take a matter of minutes. It is a noninvasive, painless and side-effect free treatment for your dog or cat. We use the therapeutic laser to treat a variety of injuries and illnesses your pet might be experiencing. It can also increase your pet's joint flexibility and relieve any joint pain your dog or cat might feel, especially in senior pets. Treatment protocols are unique to each patient and condition, and vary in time, complexity and costs. 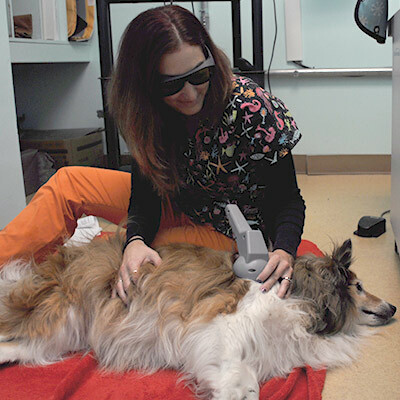 Laser therapy can also be used to enhance other treatment plans recommended by our veterinarians.